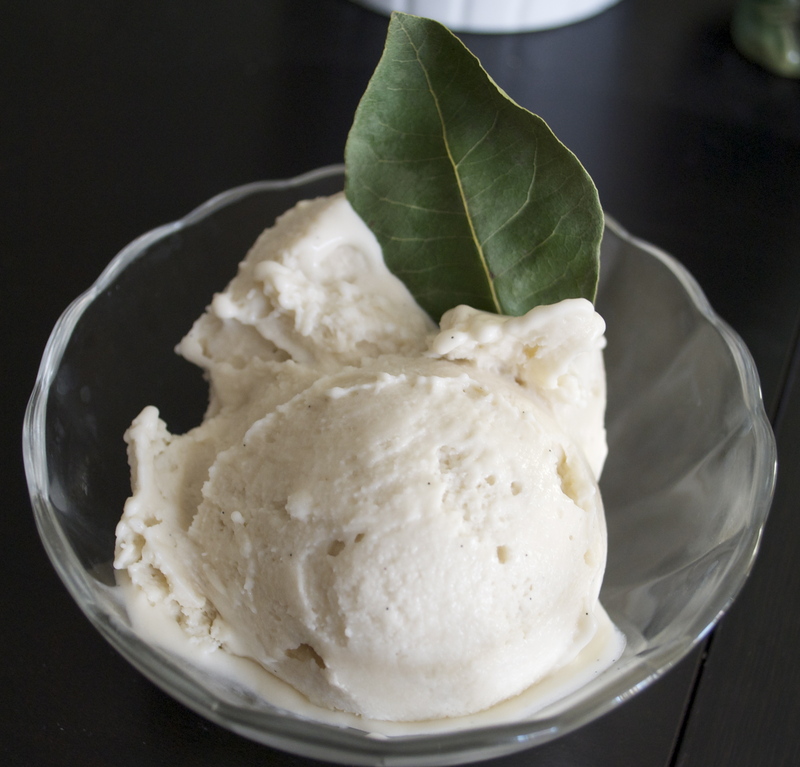 Vanilla Bean Bay Leaf Ice Cream. Homemade ice cream; it’s the best, what can I say. I always get the best results from using canned coconut milk or cashew cream for the base. It’s turns out super creamy and velvety. I saw a version of bay leaf vanilla ice cream over at my fav, Eat the Love and it sounded delicious. I went on over to the Hollywood Farmer’s Market to get some fresh bay leaves—which are great because whatever you don’t use, you just air dry and store them for soups and stews and things. The flavor of this ice cream is really amazing. I don’t know quite how to describe it, but it tastes like a cold fall night in front of a warm fireplace….or something…..Now if only we could get some actual fall weather here in LA…. In a small bowl, mix 1/4 c coconut milk with the arrowroot powder. Set aside. In a medium saucepan, whisk together the remaining coconut milk, bay leaves, coconut milk creamer, Earth Balance, sugar and vanilla bean pod. Bring mixture to a gentle boil, making sure not to get it too hot. You just want to dissolve the sugar. Remove from heat and add in the arrowroot/milk mixture. Next whisk in the vanilla bean and vodka. Pour everything into a large metal or glass bowl. Chill in the fridge until ice cream base is cold. Once the mixture is chilled, scoop out the bay leaves and vanilla bean pod. Use this mixture in your ice cream maker and mix according to the directions. I like to store ice cream in a loaf pan, cover with a sheet of plastic wrap, then cover again with a sheet of foil. ← Just a Cheesey Apple Muffin.